Yesterday was just another perezoso day - lazy day - in Kino Bay, caused by a little too much - a lot too much?? :o) - mexican firewater! 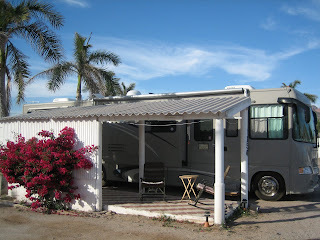 It was also easy to be lazy since it was totally overcast and windy, with an occasional raindrop. We had cruised over to the park we're looking to move into in old town, found it almost full but with several spots vacating Friday, and headed back to new town to grab a bite. We ran into the kids we had met a couple days ago from Flagstaff and somehow had a couple too many really good margaritas. And, as often happens when inbibing a little too much, we agreed to meet for more up the street at Jorge's!! Snuck in a little nap and then headed across the street at sunset for another dose of firewater! What a fun night! 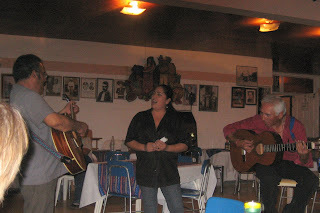 As the tourists headed home, the proprietor (Jorge) and another fellow brought out their guitars and started singing - and my, oh my, how they could sing!! Our favorite waitress, Rosita, joined in, and she has wonderful voice too! Another of the servers, young and beautiful with a sultry voice, sang a few love songs! Suddenly it was late and drunk and we were the last to be swept out! The morning was not kind. But last night? Spectacular! Lightning and thunder and wild rain! The park has little palapas - covered patios - by each site. With good old fashioned corregated roofs. The raindrops sounded to be about the size of dinner plates, and when they crashed down on the metal roofing right beside my head, it sounded like strings of firecrackers going off! In spurts, mind you, with just enough time between the strings of firecrackers to drop off to sleep and be jerked from that snooze, again and again. I heard the clock chime 2:30 before I finally slept peacefully! The sun peeked out this morning - but the weather report shows more of the same today. But everything has been well washed and smells so sweet - another day in paradise!